Steamtown is no small tourist train operation. This is a National Historic Site operated by the National Park Service and features an operating roundhouse, turntable and mainline. The Grand Opening featured steamers big and small, including China-built NYS&W 2-8-2 #142, Milwaukee Road 4-8-4 #261, Canadian pacific 4-6-2 #2317, RBM&N 4-6-2 #425 and Shay #8 from the Lowville and Beaver River. Diesels, the ribbon cutting, a steam "parade" and long train on the main take us to 100 minutes of action! Stereo sound! Award Value: 70 Points Earn points for free DVDs. Signup free. BigJim4Life (Morrisville PA US) on 2017-10-27 18:58:35. So there are some good points about this DVD. Sadly, the bad points outweigh the good by a lot. For example - and probably the biggest - there seem to be four different camera operators. Three of them use tripods, or are very steady. The fourth one, whenever they cut to this person's footage, shakes like you wouldn't believe. Not a little shaking, or a little unsteadiness - but serious shaking. Also, the editing could use some work - especially during the Grand Parade of Steam. They had all four camera operators (including the shaky one) trained on the tower area (one via zoom from further up the line, towards the main area of the grounds). You would watch an engine pass by the tower - then cut to the next camera angle, and the engine is behind the tower again, so you watch it go past - cut to the third camera angle, and look, the same engine is behind the tower again, so you watch the engine pass the tower for the third time. Cut to the shaky angle, and you get to watch the same engine pass the tower at slow speeds again for the fourth time. Then you see the engine pass by a little further down (from the camera that was zoomed in). Rinse and repeat for the next six locomotives on parade, and it really kills the action and mood. The positives? 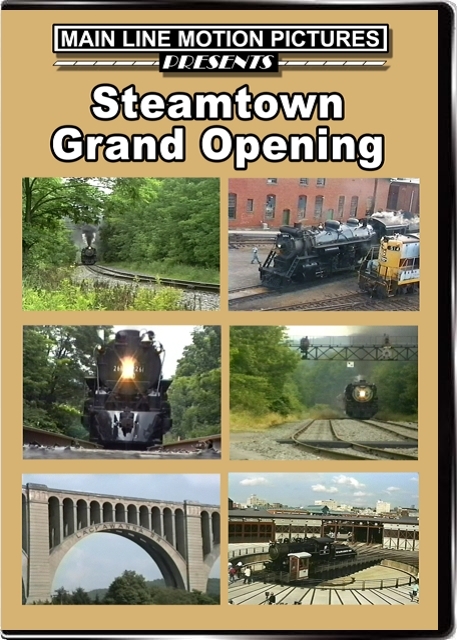 This DVD includes more footage than others of Susquehanna 2-8-2 #142's ferry move from New York down to Steamtown. And some of the action shots are decent (except for the shaky camera operator, again). However, I can't recommend that people pick up this DVD. There are others that cover the Steamtown Grand Opening better. Pick up one of those, you'll be glad you did. So what you're trying to say in the review for this one, you'll recommend both the Pentrex & Goodtimes versions of the Grand opening of this event rather than the MLMP version of this. Am I correct?